Hi there! This is another mani I did a few weeks ago. 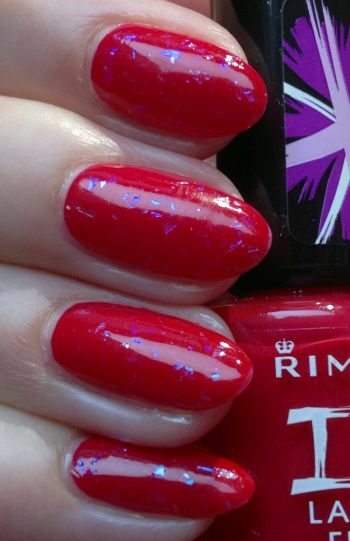 For this mani I painted my nails with Rimmel I ♥ Lasting Finish 066 Cranberry Zest (2 coats). This is a gorgeous colour. It reminds me of Revlon’s Cherries In The Snow! When I painted my nails, I realised that this polish is one of Rimmel’s scented polishes. I think scented polishes usually smell awful, but this (cranberry-scented) one was actually quite alright. The flakie top coat I used is Accessorize Bewitched. This is a low quality top coat. I had to apply 2 thick coats to achieve an acceptable finish. Hi there! 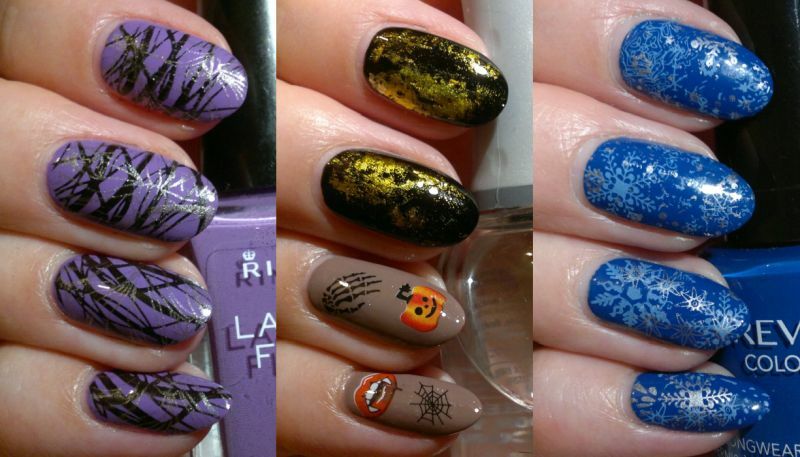 I’ve got a Nail Of The Day post for you today. For this mani I painted my nails with Rimmel I ♥ Lasting Finish 702 Marshmallow Heaven (2 easy coats). I love these milky purple shades. Of all the nail colours (and finishes) out there, “milky purple” is my favourite nail colour. 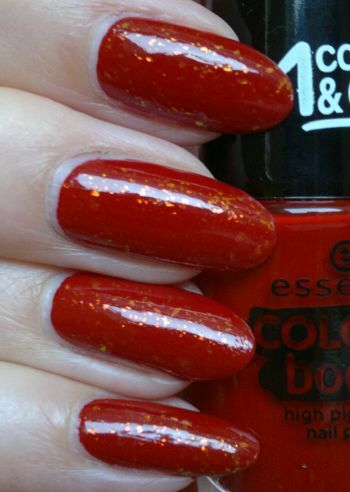 I also used one one of my favourite top coats, Essence Glamaxy Far Far Away (1 coat). This is a gorgeous rainbow flakie top coat. It doesn’t photograph well, but you can catch a glimpse of its incredible colour-shifting beauty in this photo. I really liked this mani. 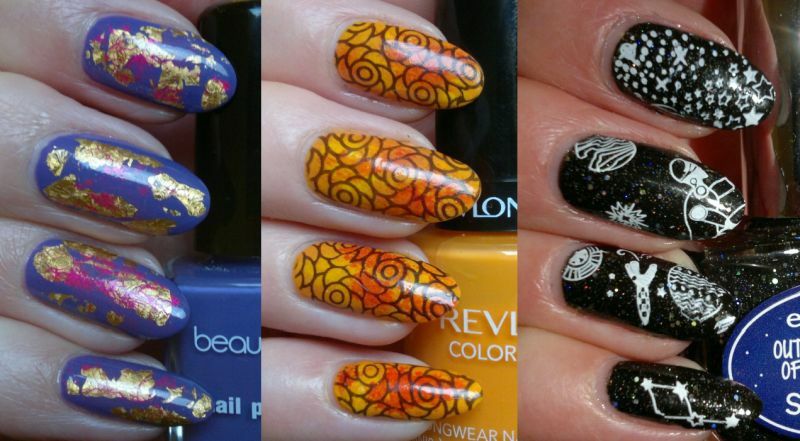 It was a simple mani, it was super easy to do, but it was very eye-catching! Hi there! Today’s post is the last one for this week. This means that Nail Week comes to an end as well. For this mani I painted my nails with Essence Colour Boost 04 Instant Love. This polish is a true one-coater. Great quality! Essence was stupid to discontinue the entire Colour Boost collection. 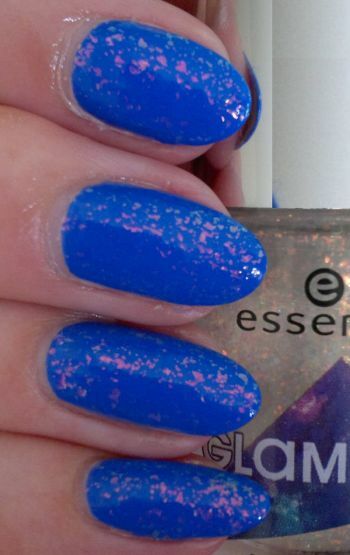 The top coat I used is the one and only Essence Glamaxy 34 Glamaxy Far, Far Away. This is the most beautiful flakie topper. No matter which base colour you choose, this flakie topper will always look good. Too bad that Essence discontinued this gem as well. 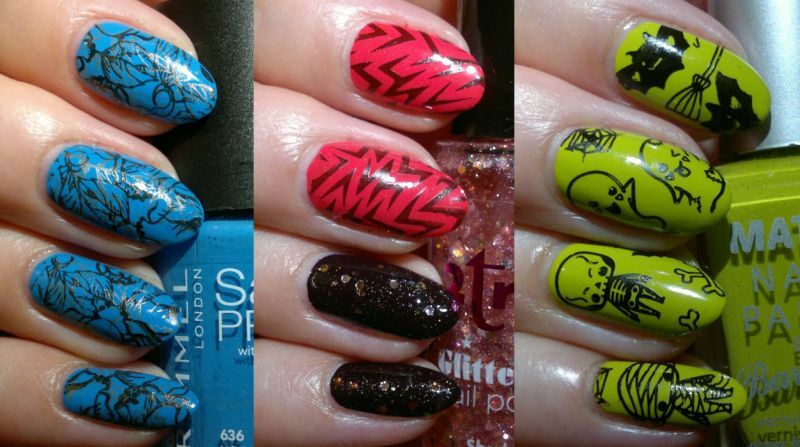 I’ve done this mani for the A-Z Nail Art Challenge which I’m doing on my own terms. This mani is for the X-Plain To Me Why You’re Doing Red Nails Again challenge. Hi there! Today’s Nail Of The Day post is about a simple mani I did recently. For this mani I painted my nails with Astor Lacque Deluxe 875 Electric Blue (2 coats). I love this polish. The formula is a dream and the colour is amazing. 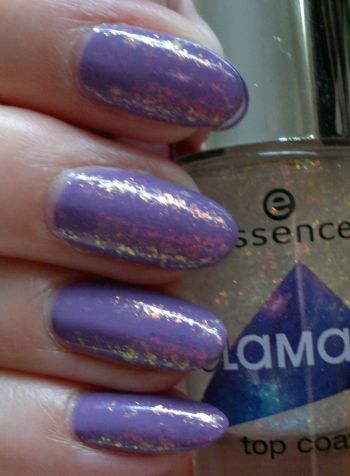 The cute flakie topper is Essence Glamaxy Top Coat 34 Glamaxy Far, Far Away. I bought this topper recently, and I’m glad I did! I really liked this mani. It was a very simple mani, but it was really pretty. How do you like this mani? 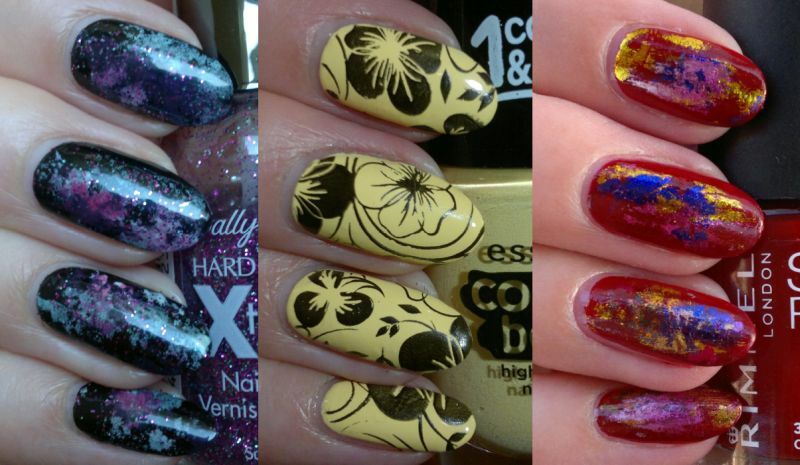 Do you love flakie top coats? Feel free to get in touch via the comments. Thanks for stopping by!